In 2008, an undocumented Ecuadorian immigrant named Marcelo Lucero was out walking with a friend on Long Island when he was attacked and ultimately stabbed to death by a group of teen boys. The attackers admitted they chose Lucero and his friend as victims because they were Hispanic. The town, Patchogue, had seen a large influx of Hispanic immigrants in recent years, and some residents were not happy about the changing culture of the area. Anti-immigrant sentiment from parents and political leaders eventually resulted in the teenagers feeling not only entitled but empowered to attack random strangers, simply based on their perceived ethnicity. 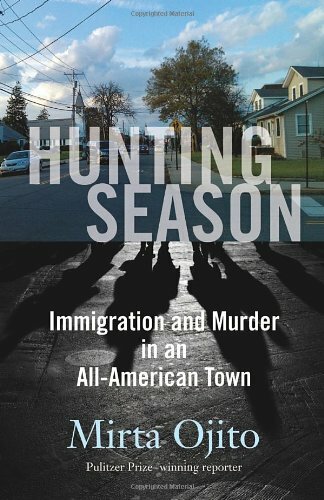 This book is an important one, I think, especially for those of us who don’t have a firsthand grasp of what it’s like to be an immigrant, legal or not, in the US in the current political climate. The level of racism and hatred in a place so close to New York City, a city of immigrants if ever there was one, is shocking. The things people were willing to say to Ojito, on the record, to be published in a book, are pretty unbelievable as well. Unfortunately, it’s a daily reality for many ethnic minorities in the US today. I’ve seen some blurbs that claim Ojito is committed to telling a balanced story (she even claims it herself in the first few pages), but I have to take issue with that. It’s true that Ojito interviewed the parents of the teens who were involved, or at least those few who agreed to talk to her. However, it’s clear from her narration that she has a strong bias in favor of immigrants, legal and illegal, and she has an agenda in writing the book. I don’t have a problem with that, and any discerning reader would be able to recognize when Ojito is shading facts with her personal perspective, but I want to point out that the claim of “unbiased reporting” is dubious in this case. As with any nonfiction selection about a hot-button issue, make sure you’re analyzing and evaluating the author’s claims. This isn’t the kind of book where you want to just nod along to the beat and soak in everything without question. Bottom line: read this book, just don’t check your brain at the door.